Industry loan growth clocked in at 4.8% YoY in April. 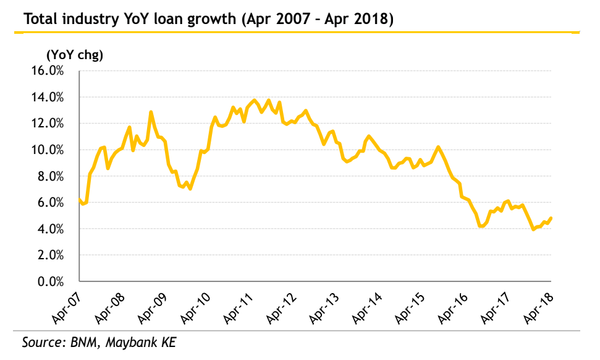 Malaysian bank loans are picking up pace after growing from 4.4% YoY in March to 4.8% YoY in April, according to Maybank Kim Eng. A sustained demand for household loans in light of the prevailing tax-free (GST-SST) period was noticeable as lending increased from 2.9% YoY in March to 3.6% YoY in April. Non-residential property lending growth normalised to from 1.6% in March to 2% YoY in April, whilst personal lending growth picked up pace from 5.4% YoY to 6% YoY. over the same period. On the non-HH front, working capital loan growth picked up pace to 1.3% YoY, after having stagnated at 0.3% YoY in March. On a sectoral basis, manufacturing loan growth rebounded, whilst stronger growth was reported for wholesale/retail and construction sectors. However, there was slower growth in loan applications and approvals as loan approvals on a three-month moving average (3M MA) basis expanded 3.2% versus 5% in March and approval rates continued to languish near recent lows. 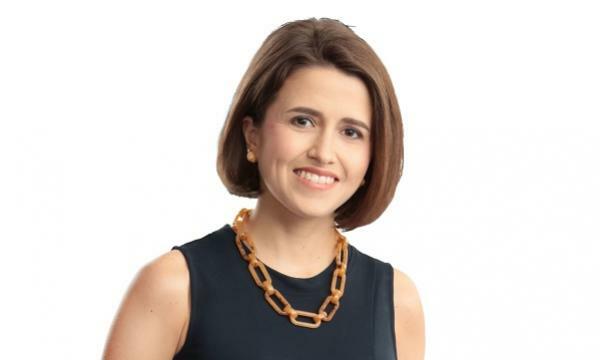 The industry's gross impaired loan (GIL) ratio also inched up from 1.57% in March to 1.58% as of end-April due to a rise in bad loans from the commercial property and auto portfolios. Credit card application 3M MA growth contracted by an even larger 10.7% YoY in Apr 2018, having contracted 5.6% YoY in Mar 2018. 3M MA approvals contracted 0.4% YoY in April (+5.5% YoY in Mar 2018) and the approval rate was a low 43%. Working capital loan applications (3M MA) jumped 16.4% YoY, having contracted over the past three consecutive months. However, loan approvals on a 3M MA basis contracted again for the third consecutive month and by 14.4% YoY. As a result, the loan approval rate remained low at just 39% in Apr 2018. Total system deposits growth in Apr 2018 was 5.4% YoY (4.9% YoY in Mar 2018), faster than loan growth. CASA growth was stable at 6.0% YoY. The pick-up in deposit growth was led by growth in business (+11.4% YoY) and Government (+17.5% YoY) deposits. Individual deposits expanded at a stable pace of 3.9% YoY while financial institution (FI) deposits contracted 1.3% YoY. Average lending rates improved further to 4.9% end-Apr from just 4.61% end-Dec 2017, as loans continue to reprice post the OPR hike in Jan 2018. Amid stable average FD rates of 3.17% in Apr 2018, the average interest spread improved further to 1.69% in Apr 2018. Against a trough of 1.30% in Sep 2015, interest spreads have been trending up over the past three years.